If you've lost a tooth (or a few teeth) due to injury or disease, dental implants from Custom Dental of Carrollton can rejuvenate both your smile and your oral health. 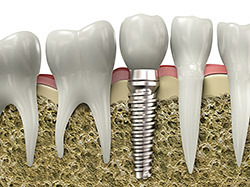 Dental implants are root shaped titanium posts that are anchored to the jawbone. The junction between the bone and the implant is biocompatible and your mouth thinks it's a natural part of the body. An abutment is screwed into the implant and serves a connector to support a natural-tooth looking crown or an implant-supported denture. Dental implants give you 90% of the function of a real tooth. Dentures can be loose or ill fitting, and don't provide the function or stability to eat the hard foods your body needs. And unlike bridges, dental implants don't anchor to the remaining teeth so they aren't weakened in the implant process. The best part of getting an implant at Custom Dental of Carrollton is the ease and convenience of having the procedure done right here in our office. There’s no need to be referred to a specialist’s office! We work with you to plan your case, do all the surgery in our office, complete the restorative phase, and be there for you to help keep your new smile healthy. We also offer a warranty service to stand by our work! You can ask our team more about this at any time. The first step for any implant is a thorough examination at our Carrollton dental office to evaluate your dental condition and which dental implant option would be right for your situation. 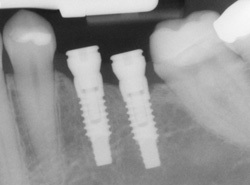 We would take any necessary X-rays to see the amount of bone below the gums to support the implant. Then together, we can talk about a plan that is right for you! Dental implants need to be cleaned daily with a toothbrush and floss just like natural teeth to remove any bacteria to keep the area healthy. We would see you on a regular preventive schedule for professional cleanings and monitoring of your new implant to help keep it healthy.